According to a new report from MacRumors, Apple will start selling AirPods in its own retail stores on December 19. The report notes that Apple is currently informing staff at its retail stores about the imminent launch. The company previously announced that the wireless earphones will be on sale in stores starting next week, however, no specific date was given. Apple’s AirPods first went on sale through the company’s online store on Tuesday, but the supplies were very limited. 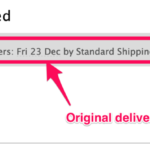 Shipping times for the device slipped within 30 mins of launch, and they now sit at six weeks. Customers who were lucky enough to get their orders in quickly are seeing delivery dates as early as December 19. Given the supply for the online launch, we expect that the in-store supplies will also be limited. As the company ramps up manufacturing, we can expect to see the device regularly available in stores and online. If you weren’t lucky enough to get your AirPod order in before the shipping date slipped, and you still want the devices before Christmas, it is worth checking out your local Apple Store on Monday.